I’ve managed to keep the ball rolling well enough with Final Fantasy V this week, playing a little bit more than I did the week prior. I’m far enough in now that I can list off some minor complaints, but by and large I’m still pretty happy with the experience. Over this last weekend I experienced my first “where the heck am I going and what the heck am I supposed to do next?” moment of Final Fantasy V. It’s becoming a trend with each game to throw at least one of these instances at you, where a significant event wraps up without actually telling you where to go. Often you can return to past locations and chat up the locals to figure things out, but that’s not always as much help as you might hope. Plus it’s tedious and boring, which means very little fun. This kind of situation actually arose twice, but both times I had just obtained new means of transportation. The first time was the Steamship, allowing me to explore the seas, and the second was the black chocobo, which let me take to higher skies than the Hiryuu (dragon) from earlier in the game. In both cases it did take some time for me to find my next destination, but at least the blow was softened by having some freedom to explore other areas. One of these areas I came upon was the town of Lix; Bartz’s hometown. I mentioned last time that of my party members Bartz’s background had been explored the least, so it was nice to find his home and learn a bit more about him. The town is seemingly optional and can be completely bypassed, which made it a nice little surprise to stumble on. In addition I also found some bonus caves and hidden esper battles, earning me new summonable allies like Shiva and Ifrit. Sometimes it pays to get lost in these games. 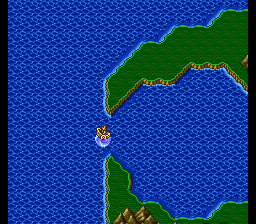 All these extra areas that aren’t mandatory to the story make Final Fantasy V feel so much more like the Final Fantasy games I’m used to. That’s not exactly surprising since I started with Final Fantasy VII, which is only two games away now (!! ), but it’s still nice to see the transition happening. Final Fantasy IV excelled at telling a good story, and hidden/extra battles started back in Final Fantasy III, but Final Fantasy V really pushes the envelope in all aspects. This plethora extra content hasn’t slowed down the plot at all, as I’ve entered the next big part of the game by jumping to a new world entirely. 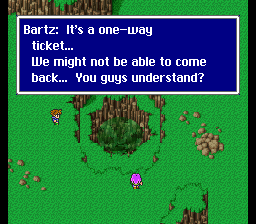 In fact I was starting to speculate that I was nearing the game’s finale after a mere 12 hours, when I left the starting world and Bartz was like, “We may never be able to return!” Generally that’s a surefire signal that you’ll be facing the final boss soon, but when I arrived on Galuf’s world (spoiler – he’s got his memory back and he wasn’t from the same plane as the rest of my team! shock and awe!) I had a new world map, fitted out with at least a dozen new locations to find and check out. Suddenly that confrontation with Exdeath is looking to happen closer to the 25-hour mark. Of course, that’s assuming Exdeath is, indeed, the big bad behind all the evil deeds. Let’s jump back a few paragraphs to those modes of transportation I mentioned. One of the things that’s bugging me about Final Fantasy V is how little use I’ve gotten from each new vehicle or animal. Faris joined my team so I could use her boat; then I encountered a whirlpool and it capsized. I climbed a mountain and saved a dragon and used it to reach two new areas; then I left it next to a meteor while I teleported away. Later Cid and Mid fixed up the Steamship for me, which I only needed to reach one new town; as soon as I entered the town an earthquake happened which swallowed my new ship. My very next objective was to capture a black chocobo; that guy gave me a bit more freedom, but still was only necessary in reaching one or two new places before leaving him behind. I totally understand that in order to press forward I have to leave old areas behind, and each vehicle has its own limitations regarding where it can and can’t go or where it can lift off or land or dock, but Jiminy Cricket! At least let me hang onto one of them long enough to become attached! Finally I happened upon a proper airship and thought surely that would be my go-to until the end of the game, but then I was teleported to a totally new world, leaving my dragon, my chocobo, and my airship all back where I came from. This is nit-picking, and I’m wholly aware of that, but it’s just so obnoxious. Really though, that’s not enough of a complaint to frustrate me to the point of wanting to just finish the game so I can move on. 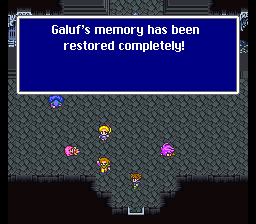 I’m still having a great time with Final Fantasy V, and look forward to exploring Galuf’s world in the coming week. Next time I load up the game I’m going on a moogle hunt, as they make their first appearance since their first appearance in FFIII, taking a break during FFIV. I don’t imagine I’ll be quite finished with the game by next week’s update, but I should certainly be closing in on it. In the mean time, remember to follow me on Twitter and keep up with the #RoadtoXVin15 hashtag!